A 300 million year-old fossil mystery has been solved by a research team led by the University of Leicester, which has identified that the ancient 'Tully Monster' was a vertebrate—due to the unique characteristics of its eyes. Tullimonstrum gregarium or as it is more commonly known the 'Tully Monster', found only in coal quarries in Illinois, Northern America, is known to many Americans because its alien-like image can be seen on the sides of large U-haul trailers which ply the freeways. Despite being an iconic image—a fossil with a striped body, large tail, a pair of stalks terminating in dark, oval-shaped 'blobs' and a large elephant trunk-like proboscis at the head end which has a pincer-like claw filled with teeth—it is a complete mystery as to what kind of extinct animal it was. Professor Sarah Gabbott from the University of Leicester's Department of Geology said: "Since its discovery over 60 years ago scientists have suggested it is a whole parade of completely different creatures ranging from molluscs to worms—but there was no conclusive evidence and so speculation continued." Thomas Clements, a PhD student from the University of Leicester and lead author on the paper, explained: "When a fossil has anatomy this bizarre it's difficult to know where to start, so we decided to look at the most striking feature—the stalked structures with dark blobs." In a new study published in Nature, the University of Leicester palaeontologists, along with colleagues at the University of Bristol and the University of Texas in Austin, discovered that the dark 'blobs' were actually made up of hundreds of thousands of microscopic dark granules, each 50 times smaller than the width of a human hair. Dr Jakob Vinther (University of Bristol) said: "We used a new technique called Time of Flight Secondary Ion Mass Spectrometry (ToF-SIMS) to identify the chemical signature of the fossil granules and compared it to known modern melanin from crows and this proved that we had discovered the oldest fossil pigment currently known." Thomas added: "Nearly all animals can produce the pigment melanin. It's what gives humans the range of skin and hair colours we see today. Melanin is also found in the eyes of many animal groups where it stops light from bouncing around inside the eyeball and allows the formation of a clear visual image." Professor Gabbott said: "There were two distinct shapes of melanosomes in Tullimonstrum's eyes: some look like microscopic 'sausages' and others like microscopic 'meatballs'. 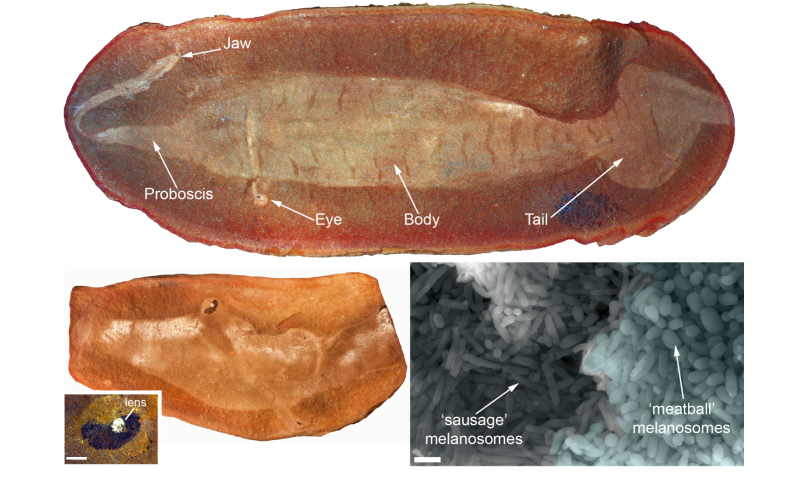 This evidence was crucial because only vertebrates have two different shapes of melanosome, meaning that unlike previous researchers that thought that Tullimonstrum was an invertebrate (animal without a backbone), this is the first unequivocal evidence that Tullimonstrum is a member of the same group of animals as us, the vertebrates." Thomas added: "This is an exciting study because not have we discovered the oldest fossil pigment, but the structures seen in Tullimonstrum's eyes suggest it had good vision. The large tail and teeth suggest that the Tully Monster is in fact a type of very weird fish." This "news" is a month old. I guess the spinal cord running down the center wasn't a clue. With eyes that can stick out of the sand and a mouth that can twist and snap at passing food, I suspect this was an ambush predator. Sort of. The previous news http://phys.org/n...ate.html was from a completely different team using different physical evidence. I bet the University of Leicester team is pretty bummed to have been scooped by a month because both teams were likely working on this for several years. You can't see its spine in that photo, the specimen is laying down, facing left, that thing running through the middle of it is not its spine.